Apple CarPlay is a simple and smart way to sync your Apple iPhone ® to your car. CarPlay enables you to display and control certain phone apps that are optimised for in-car usage and functionality via the vehicle’s infotainment display’s touchscreen or through voice commands. 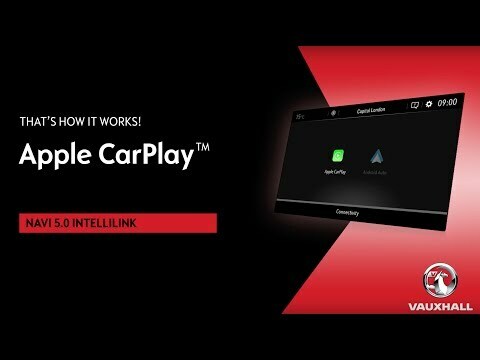 With the introduction of Vauxhall OnStar, our phones and tablets aren’t all that’s connected to the internet, now our cars are too and CarPlay is Apple’s solution to giving motorists a seamless online experience from their phone to their car, available across the range from 2016 model year onwards their is a good chance your vehicle will be compatible. Our guide below touches on CarPlay compatible models, key features plus quick and easy instructions on how to pair your Iphone to your car. Apple CarPlay was developed to allow Iphone users to carry out the everyday functions that they would with their phones via their car so making and receiving calls, listening to music, using Sat Nav and even reading and replying to messages can all be conveniently done and will be displayed all on your Vauxhall’s in-built display, avoiding the temptation to illegally use your phone while behind the wheel and ensuring your eyes are focused on the road ahead. And what’s even more convenient is that navigating through your iPhone via your Vauxhall couldn’t be simpler. It’s up to you, you can choose to either use the steering wheel-mounted controls, your in-built touchscreen infotainment system, or simply ask Siri, Apple’s personal assistant, to carry out tasks for you, such as “Hey Siri, call mum.” – it’s really as simple as that! Apple CarPlay’s intuitive Maps integration really does make the system and great co-pilot. As well as the ability to ask Siri to give you directions to say, the nearest petrol station, CarPlay can also predict where you’re most likely to want to go by using addresses in your emails, text messages, contacts, and calendars. It’s really THAT powerful. How do I connect my iPhone to my Vauxhall? ​Make sure that Siri is enabled on your iPhone. Connect your iPhone to the infotainment system with a lightening cable. For best performance you should use your phone’s factory-provided lightening cable. Unlock your iPhone and allow CarPlay to access your iPhone. If CarPlay does not start automatically, press on the CarPlay icon on the home screen of the infotainment system. Please note that some functions of CarPlay, like music streaming or Siri voice recognition, might require a 3G or 4G Internet connection. Is my Vauxhall CarPlay Compatible?